Home » Coast to coast » 2016 WWP Election Campaign statement of solidarity with striking food service workers at Harvard U. 2016 WWP Election Campaign statement of solidarity with striking food service workers at Harvard U.
Harvard workers on strike, Oct. 9. Victory to the striking HUDS workers! A living wage and quality health care are rights! End racism and discrimination in Harvard’s kitchens now! 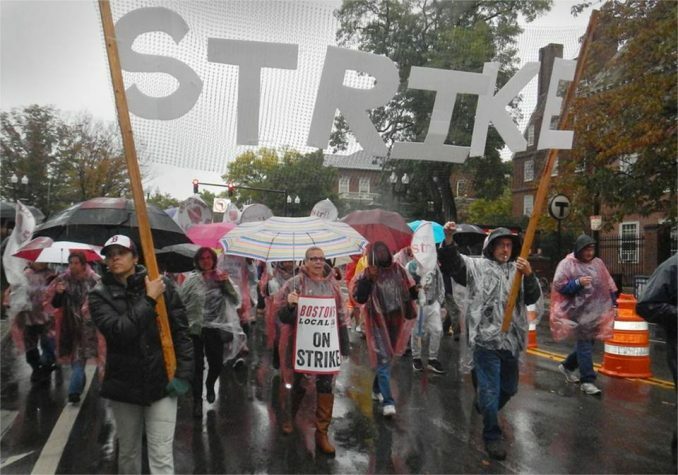 The Workers World Party presidential campaign of Monica Moorehead and Lamont Lilly is proud to stand in solidarity with our sisters and brothers at Harvard University who are on strike against the wealthiest Ivy League school in the U.S. They are members of UNITE HERE Local 26. The 750 Harvard University Dining Service workers lovingly cook for and feed people from around the world, serving 25,000 meals a day. The HUDS workers are African American, African, Latinx, Asian, and white; many are immigrants. Some of them are just out of high school, others are holding out for retirement. By throwing down the ladles and hitting the bricks, these courageous strikers are holding the line and fighting back for tens of millions of workers across the country and worldwide who face corporate and government attacks on their health, welfare and living standards. In their militant strike, the Harvard workers are fighting for all workers. The HUDS strikers are facing off scab deliveries of frozen foods and halting construction at vaulted halls. They are banging drums and proclaiming through bullhorns, “¡Sí, se puede!” (“Yes, we can!”), as they rally in prestigious Harvard Yard for the justice they have earned and deserve — and which everyone knows the university can afford. Harvard’s plan to cut back its food service workers’ health insurance coverage, while keeping annual wages for many below $35,000, is clearly an imposition of austerity. 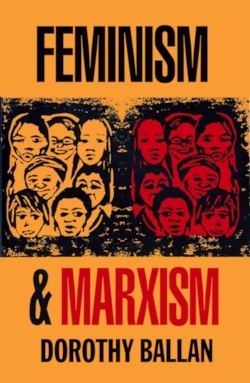 This political and economic policy is in line with austerity programs being inflicted by the capitalist class on the U.S. and international working class. Harvard University’s endowment of $38 billion puts this corporation at the top of the wealthy Ivy League schools, with a larger treasury than many countries. Giants of finance capital like Goldman Sachs, Bank of America and Citigroup are writing its contract proposals, while titans of the U.S. military, diplomatic, economic and technocratic corps are running its Kennedy School of Government. To add insult to injury, the pro-corporate tax code allows Harvard to avoid paying taxes, including for unemployment insurance. This means that for several months a year during school breaks, these workers are laid off with no income, and are forced to fend for themselves. The strikers were Inspired by the historic Black Lives Matter movement at Harvard last semester, when students won victories to abolish the racist “house master” title and discard a law school coat of arms depicting its founder’s slaves at work. Their demands include the establishment in the collective bargaining agreement of a task force to combat racism and discrimination in the kitchens. We applaud UNITE HERE’s groundbreaking language that will strengthen gender identity protections, stop management discrimination in hiring formerly incarcerated people, and permit immigrant workers to take up to a year’s leave with job security and other rights not protected by federal law. Contrary to Harvard’s vicious propaganda, the strikers have been enthusiastically joined on the picket lines by hundreds of students, faculty members, clerical and technical workers, and groundskeepers. Supporters have come from across Boston; the city’s communities view this fight as their own and consider the HUDS workers to be family members who are being threatened — and must be defended by every means necessary. Harvard has not only gouged its own students, demanding a king’s ransom for tuition, bringing them a lifetime of debt peonage, but the school has moved to turn faculty into part-timers, too. The university has also forced huge concessions on some of its other workers and retirees. Harvard’s sprawling real estate empire has caused spiraling neighborhood rents and forced mass dislocation throughout Cambridge and Boston communities. Its business conglomerates in charter school administration, public health and government consulting have pushed privatization, “uberization” and militarization to new levels. We stand with the HUDS strikers and concur with their vision that a better world is in birth. Full-time jobs for all now! A minimum $35,000 yearly wage for Harvard workers! Hands off HUDS workers’ health insurance!